Description: Plants 80-120 mm long, yellow-brown in colour, turning black when dry, and often so dry that the fronds disintegrate when trodden upon; regularly dichotomously branched with a disctinct channel on the underside (the side nearest the rock), which holds moisture and apparently helps the wrack to survive at very high levels on the shore. Reproduction in conceptacles visible as dots (below) on warty terminal receptacles. 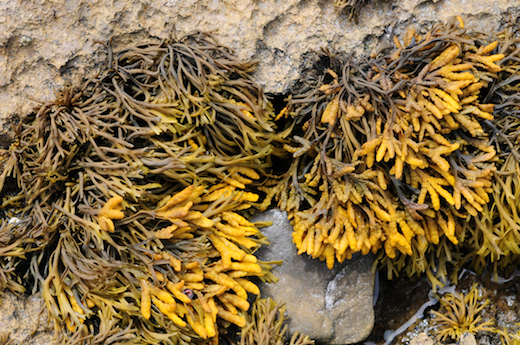 Usually infected by a fungus which may assist in allowing it to survive high in the intertidal. Habitat: Occurring very high on the shore, generally above MHWN, on wave-exposed and sheltered shores, but absent from very exposed roacky shores. Some free-living ecotypes (var. libera) occur in salt-marshes. 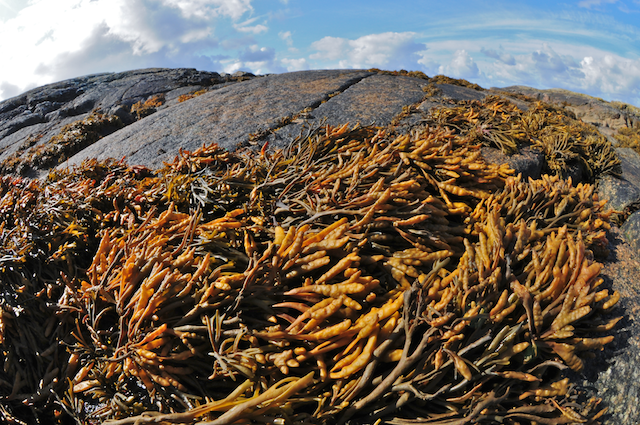 Similar species: No other wrack has the distinct channeling of Pelvetia. Key characteristics: Channeled frond, regular dichotomies, height on shore. Distribution: confined to the NE Atlantic from the Faroes south to Portugal. Site © M.D. Guiry 2000 - 2019. Important copyright notice: all text, design and photographs on this site are copyrighted by M.D. Guiry unless otherwise stated and all rights are strictly reserved. Click here for copyright information and contact. Website design: 249 Design Studio. Site maintained by M.D. Guiry (michael.guiry@nuigalway.ie). There have been 8736732 page loads since 1 January 2014 on 25 April 2019.